DALLAS, TX--(Marketwired - Mar 9, 2016) - Parks Associates announced new consumer research today showing smartphone owners spend more time per day listening to music on their device compared to other major entertainment activities. The research, 360 View Update: m-Commerce and Entertainment Apps: Usage Trends, notes 68% of smartphone owners listen to streaming music daily, while 71% watch short video clips, but video viewers spend only 24 minutes on average watching short clips, while streaming music consumers spend 45 minutes per day on this activity. "Currently Amazon Prime Music is the most popular paid music subscription service among U.S. broadband households, thanks to its inclusion in Amazon Prime, but the streaming music war has intensified as the large connected entertainment companies are driving to consolidate their offerings," said Harry Wang, Director, Health & Mobile Product Research, Parks Associates. "Apple launched Apple Music, and Google is consolidating its music offerings across its Play content store and YouTube platform. Consumers are getting more music options as the competition for users escalates." Digital media usage also varies based on OS brand and carrier. iPhone users consume more media content than users of Android and other operating systems. 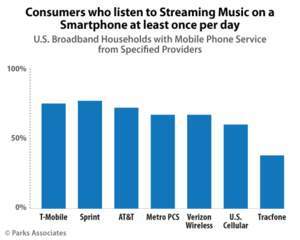 T-Mobile and Sprint customers have the highest incidence of daily music consumption among U.S. carriers -- over 75% of subscribers for T-Mobile or Sprint listen to streaming music daily, versus 66% of Verizon users. Smartphone owners spend an average of 28 minutes per day playing games on their mobile device. 40% of smartphone owners watch longer video clips such as TV or movies at least once per day. 45% of iPhone owners watch movies or TV shows on their phones daily; 40% of Samsung phone owners watch these longer video clips on their device at least once per day. Wang will address trends among mobile data usage, mobile media consumption, and new roles for wearables at the 20th-annual CONNECTIONS™: The Premier Connected Home Conference, May 24-26, in San Francisco. For more information on this research, visit www.parksassociates.com. To schedule an interview with Harry Wang or to request specific data, contact Holly Sprague at hsprague@gmail.com, 720.987.6614.